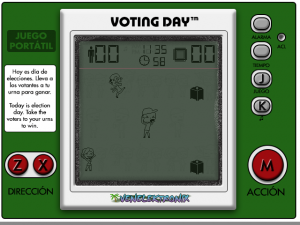 Voting Day is my contribution to encourage all Venezuelans to go vote on next presidential elections. The game is based in the old Game&Watch series of games, so the way to play is simple. Share it with your friends. For web browsers in desktops, cell phones and tablets. Design and programming: Ciro Durán. Graphics: Alexander Hass (@Gagz9k) and Ciro Durán. Thanks to: Yole Quintero, Julián Rojas Millán and Saúl González.